Norton has announced it will bring all three of its stunning new bikes to the Carole Nash MCN London Show, which runs from February 4-7 at London's ExCeL. Book your tickets in advance and save £££'s! Enter the promo code LMS07 when booking online at www.mcnmotorcycleshow.com, or quote when calling 0844 581 0752. The new Commando has generated huge interest since Norton was bought a year ago, and the recently announced Café Racer and Sport variants have just added to the excitement about the classic British marque. Garner said the whole Norton team had been overwhelmed by the recent public response to the bikes. “We went to the NEC, then to the LA Show in America and also to one in Toronto, Canada and we’ve had a fabulous uptake from all three shows. 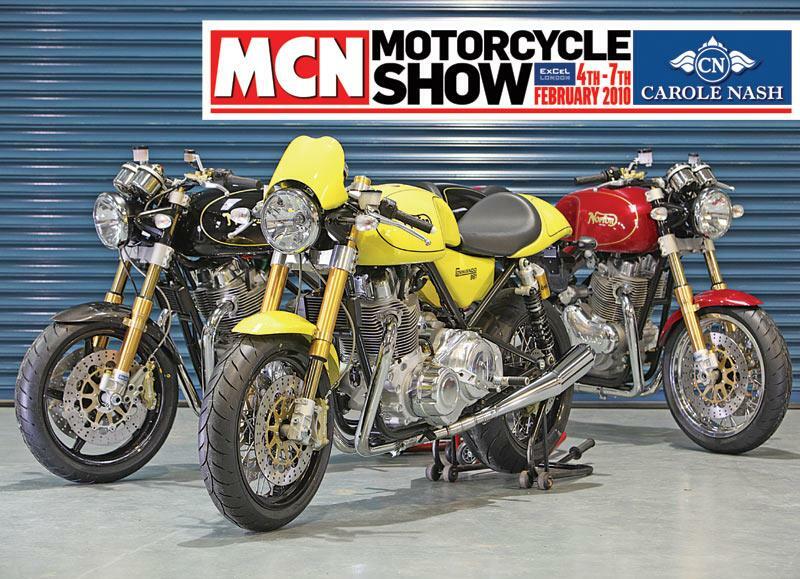 Norton join other major manufacturers appearing at the Caroel Nash MCN London Show. Even Honda and Harley will be there – two key manufacturers which did not appear at the NEC Show in November last year.